I rarely eat or cook fish/seafood. I can tell you that. And I hate shrimps for obvious reason, the smell and my allergy. But when some friends asked me to cook fish dishes, I had to improvise. Actually, I tried this recipe for lamb chop, or sometimes even for grilled tenderloin. 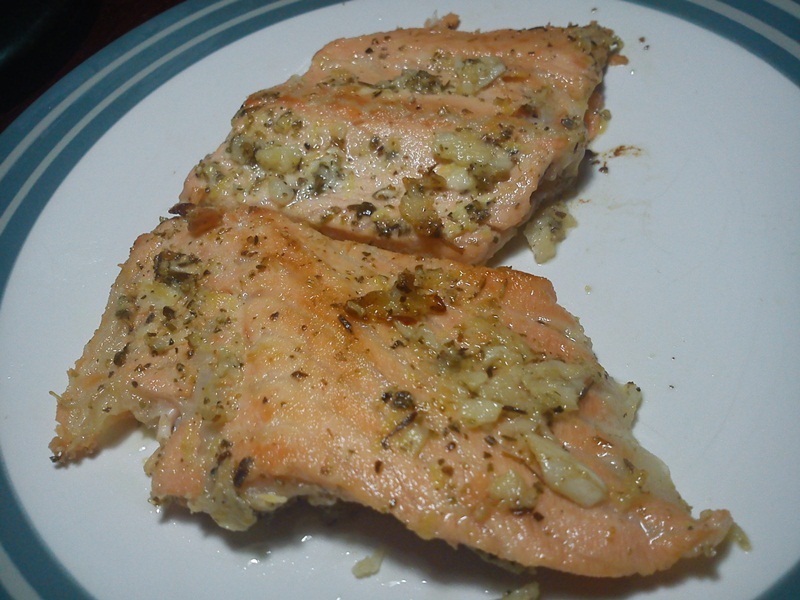 But turns out, it was excellent for salmon fillet as well. Mix the first 7 ingredients together in a bowl (You only need two tbsp. of lemon juice, but if you like more of sourness, you can add more). Put the salmon in a sealable plastic bag and pour the marinade over them. Shake or turn the plastic bag, so the marinade coats the fillet well. Marinate for 1 hour in the refrigerator, or more for better taste. Pour two tablespoons of olive oil into flat frying pan. And fry on both side, 3-5 minutes each. Serve with potato fries, and some chili sauce. So far, none of my friend died from eating this. Honest! Lemon, zested. You gotta love the smell. A combo of dried oregano, thyme, rosemary and basil. I used it almost in every cooking I made. I liked this one. Probably because of the name. Slice the lemon, and juice them. Not too much though. This should keep Edward the sparkling vampire, away.